Arctic ground squirrels are members of the family Sciuridae, which includes marmots, chipmunks, prairie dogs and squirrels. Arctic ground squirrels are the only ground squirrel species in Alaska. Arctic ground squirrels are the largest of the North American ground squirrel species, ranging from 524 up to 1,500 grams in weight, and 332 to 495 mm in length. They undergo seasonal changes in body mass and lose weight during hibernation. They exhibit sexual dimorphism, with males being larger than females. Body mass drastically varies seasonally, between summer foraging bouts and winter hibernation. They have tawny brown coloration with white flecks on the dorsal side of the pelage and a light tan or beige coloration on their undersides. Their undersides lighten during winter months. Cylindrical in shape with short, strong forearms and hind legs, the arctic ground squirrel is built for burrowing and digging. They have sharp claws and soft pads on the undersides of the hands which aid them in manipulating food and dirt. Their heads and ears are rounded, and their tails are relatively short compared to other squirrel species. Mating season for arctic ground squirrels occurs in late April to early May, after they awake from hibernation. Males aggressively defend territories with multiple females, displaying a polygynous mating system. Males seeking to expand or find new territory will often engage in infanticide. Females will group together after breeding in kin clusters which are thought to provide a higher level of protection from infanticidal males, in addition to protection from predators. Males display a significant trade-off between survival rate and reproduction. Their aggressive territorial behavior produces raised stress levels that can result in up to 21 percent lowered body mass, and compromised immune systems. These compromises in body conditions result in a high mortality rate in male arctic ground squirrels after breeding season, and the ratio of females becomes much higher than males after breeding season. Females have a 25-30 day gestation period, after which they give birth litters of two to 10 blind, hairless, and toothless young. Offspring grow rapidly for the first few weeks of their lives, and by eight to 10 weeks of age, young disperse from the den. By the following spring, young have reached sexual maturity. Arctic ground squirrels are highly opportunistic feeders. They have a widely varied diet which includes vegetation such as stems and leaves, roots, fruits, seeds, flowers, grasses and sedges, and other green or woody plants, as well as mushrooms. Along with vegetation, arctic ground squirrels are known to eat eggs, invertebrates, and small vertebrates including juvenile snowshoe hares, collared lemmings, and even their own young. Food is stored or cached only by male arctic ground squirrels in burrows for arousal from winter hibernation. As an adaptation for coping with the harsh, inclement weather of the winter months, arctic ground squirrels hibernate for about eight months out of the year. Their chosen hibernacula have coverage provided by vegetation, rather than open, windswept burrows. This vegetation coverage allows for a higher accumulation of snow and warmer soil temperatures. Females enter hibernation first, beginning in August, and are followed by males throughout the following month. During winter hibernation, arctic ground squirrels enter into a state of torpor in which their metabolic rate and body temperatures are drastically lowered for up to three weeks at a time. Their body temperature drops from about 99 degrees F (37 degrees C) to as cold as 27 degrees F (-3 degrees C), below freezing. Between these states of torpor they arouse and will either shiver or use their stored fat to bring their body temperatures back to a euthermic, or comfortable state of about 34–36 degrees Celsius. This rewarming period usually lasts one to two days and then they return to their state of torpor in order to conserve energy. Males will emerge from hibernation earlier than females in order to reach sexual maturation before breeding season, since this kind of development is not possible in the extremely cold temperatures of winter months. They will have generally lost almost a third of their body mass by this point, and will begin to consume their food cache. Females emerge around two to three weeks later, experiencing a greater loss in body fat than males, having lost over one third of their body weight. 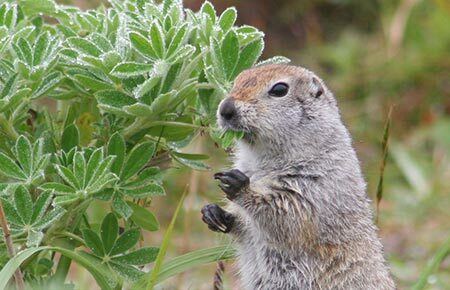 The arctic ground squirrel ranges across northern, eastern, and southwestern Alaska at elevations ranging from sea level to well above mountain tree lines. It is the only ground squirrel species in its range. They occur in tundra, meadow, riverbank, and lakeshore habitats with loose soils that provide early vegetation. Arctic ground squirrels show how human modifications to the landscape can alter the range of wild animals. Having discovered that the loosened ground along road shoulders is good for burrow construction, arctic ground squirrels are now common throughout the road system—not just in their typical habitat of dry, open, often rocky tundra. They sometimes den in soft sandy soils along the coast where they may drown in unusually high fall storm surges or easily be dug up for a grizzly’s meal. 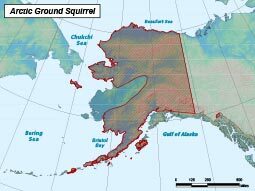 As part of the Alaska State Department of Fish and Game’s Comprehensive Wildlife Conservation Strategy, several subspecies of arctic ground squirrel have been identified as a G5T3 status which is, "vulnerable — at moderate risk of extinction due to a restricted range, relatively few populations (often 80 or fewer), recent and widespread declines, or other factors." Stable (unchanged or within +/- 10% fluctuation in population, range, area occupied, and/or number or condition of occurrences). Ranges widely throughout alpine and subalpine habitats in northern, eastern, and southwestern AK. Plants, invertebrates, small vertebrates (including their own species), eggs, birds, and carrion. Golden eagles, gyrfalcon, rough-legged hawk, ermine, wolves, arctic fox, grizzly bear, and humans. Females give birth to litters of two to 10 offspring after a gestation period of 25–30 days.